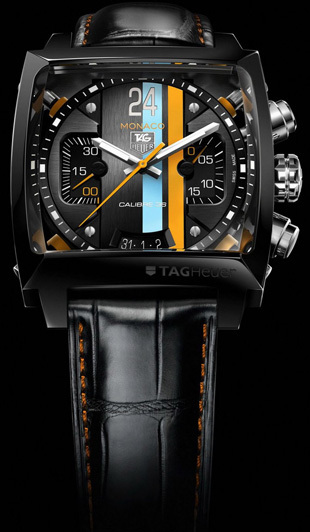 The CAL5180.FC6265 TAG Heuer Monaco Twenty-Four Calibre 36 Chronograph Men’s Watch is part of the latest additions to the Monaco line, and was recently debuted at the Basel Fair in Switzerland. Not yet available to the public, this technically advanced watch is sure to be a quick seller when it is released in November of 2010. The TAG Heuer Monaco Twenty-Four Calibre 36 Chronograph boasts a notably advanced movement. It is the first watch to have what the company describes as an Advanced Dynamic Absorber system. This system provides unrivaled protection to the movement against otherwise damaging actions like high force impacts. The movement itself is the Calibre 36, which moves at an very high 36,000 beats per hour. Owners can also watch the annular oscillating mass through the sapphire crystal case back. The Monaco Twenty-Four Calibre 36 is a true racing-inspired watch. It features two subdials at 3 and 9 o’clock which show the minutes and small seconds of the chronograph, respectively. The black dial shows a large “24” at 12 o’clock, signaling its heritage in the 24 Le Mans race. The Porsche 917k Gulf driven by Steve McQueen is also honored with blue and orange racing stripes traveling vertically down the dial. Other notable features of the Twenty-Four Calibre 36 are its see-through dial that is composed of two parts, its black PVD-coated case that is finely polished, and its black alligator strap. It is water resistant to 100 meters. Hello Tag Heuer blogger, good morning. Wonderful post. You have gained a new reader. Please continue this awesome work and I look forward to more of your superb articles.